Bogotá (/ˈboʊɡəˌtɑː/, /ˌbɒɡəˈtɑː/, /ˌboʊɡəˈtɑː/; [boɣoˈta]), officially Bogotá, Distrito Capital, abbreviated Bogotá, D.C. (during the time of Spanish rule, and also from 1991 to 2000, called Santa Fé de Bogotá) is the capital and largest city of Colombia administered as the Capital District, although often thought of as part of Cundinamarca. Bogotá is a territorial entity of the first order, with the same administrative status as the departments of Colombia. It is the political, economic, administrative, industrial, artistic, cultural, and sports center of the country. The city is located in the centre of Colombia, on a high plateau known as the Bogotá savanna, part of the Altiplano Cundiboyacense located in the Eastern Cordillera of the Andes. It is the third-highest capital in South America (after Quito and Sucre), at an average of 2,640 metres (8,660 ft) above sea level. Subdivided into 20 localities, Bogotá has an area of 1,587 square kilometres (613 square miles) and a relatively fresh climate that is constant over the year. Bogotá was founded as the capital of the New Kingdom of Granada on August 6, 1538, by Spanish conquistador Gonzalo Jiménez de Quesada after a harsh expedition into the Andes conquering the Muisca. The Muisca were the indigenous inhabitants of the region and called the settlement where Bogotá was founded Bacatá. After the Battle of Boyacá on August 7, 1819, Bogotá became the capital of the independent nation of Gran Colombia. Since the Viceroyalty of New Granada's independence from the Spanish Empire and during the formation of the present Colombia, Bogotá remained the capital of this territory. The airport of the city, El Dorado International Airport, named after the mythical El Dorado, has the largest volume of cargo transported in Latin America, and is third in number of people. 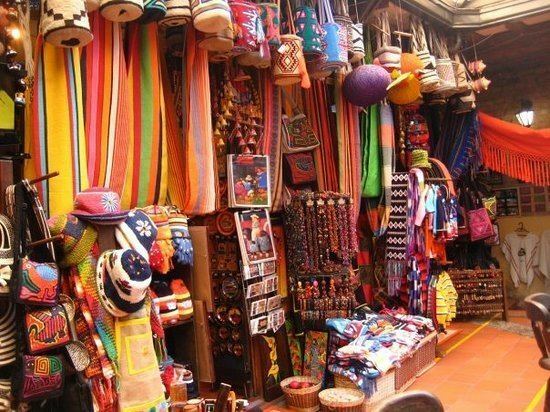 It is the city of Colombia with the largest number of universities and research centers, and has an important cultural offer, which is represented in many museums, of which the Museo del Oro is the most important, theaters and libraries. 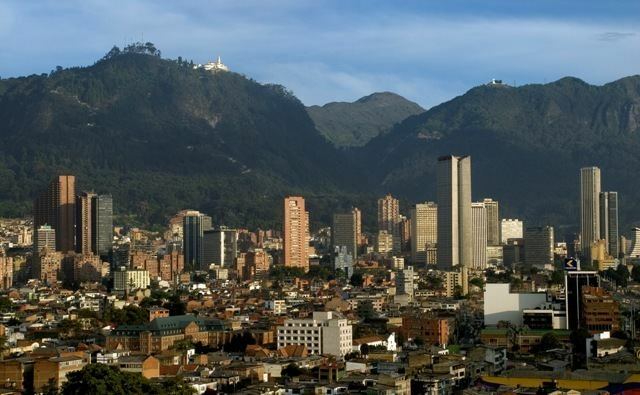 Bogotá ranks 52nd on the Global Cities Index 2014, and is considered a global city type "Beta" by GaWC. Bogotá has a subtropical highland climate (Köppen Cwb). The average temperature is 14.5 °C (58 °F), varying from 6 to 19 °C (43 to 66 °F) on sunny days to 10 to 18 °C (50 to 64 °F) on rainy days. Dry and rainy seasons alternate throughout the year. The driest months are December, January, July and August. The warmest month is March, bringing a maximum of 19.7 °C (67.5 °F). The coolest nights occur in January, with an average of 7.6 °C (45.7 °F) in the city; fog is very usual in early morning, 220 days per year, whilst clear sky sunny full days are quite unusual. The zipa at the moment of Spanish conquest was Tisquesusa. His main bohío was in Bacatá with others in Funza and Cajicá, giving name to the present day capital of Colombia. A prophecy in his life came true; he would be dying, bathing in his own blood. Defending Funza with a reduced army of guecha warriors against the heavily exhausted but heavily armed strangers, his reign fell in the hands of Gonzalo Jiménez de Quesada and his younger brother Hernán Pérez on April 20, 1537. Upon his death, his brother Sagipa became the last zipa, against the inheritance tradition of the Muisca. Sagipa used to be a main captain for Tisquesusa but quickly submitted to the Spanish rulers. The first encomenderos asked high prices in valuable products and agricultural production from the indigenous people. On top of that various epidemics of European viruses razed through the population, of which in current Boyacá 65–85 % of the Muisca were killed within 100 years. From 1533, a belief persisted that the Río Grande de la Magdalena was the trail to the South Sea, to Peru, legendary El Dorado. Such was the target of Gonzalo Jiménez de Quesada, the Granadanian conquistador who left Santa Marta on 6 April 1536 with 800 soldiers, heading towards the interior of current Colombia. The expedition divided into two groups, one under Quesada's command to move on land, and the other commanded by Diego de Urbino would go up river in four brigantine ships to, later on, meet Quesada troops at the site named Tora de las Barrancas Bermejas. When they arrived, they heard news about Indians inhabiting the south and making large salt cakes used to trade for wild cotton and fish. Jiménez decided to abandon the route to Peru and cross the mountain in search of salt villages. They saw crops, trails, white salt cakes and then huts where they found corn, yucca and beans. From Tora, the expedition went up the Opón River and found indigenous people covered with very finely painted cotton mantles. When they arrived in Muisca territories, of the expedition leaving Santa Marta, only 162 men were left. 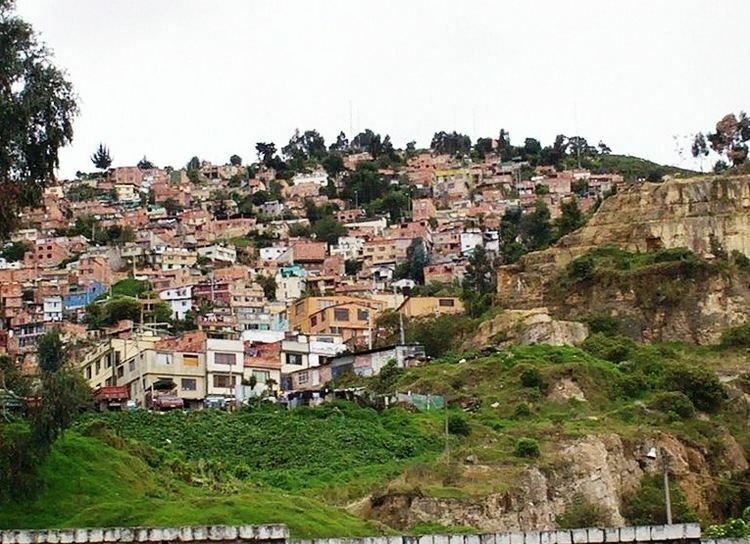 The ethnic composition of the city’s population includes minorities of Afro-Colombian people (1.5%), and Indigenous Amerindians (0.2%); 98.27% of the population has no ethnic affiliation, but are mestizos and whites. Bogotá has gone to great lengths to change its formerly notorious crime rate and its image with increasing success after being considered in the 1990s to be one of the most violent cities in the world. In 1993 there were 4,352 murders at a rate of 81 per 100,000 people; in 2007 Bogotá suffered 1,401 murders at a rate of 19 per 100,000 inhabitants, and had a further reduction to 16.9 per 100,000 inhabitants in 2012 (the lowest since 1983). This success was mainly the result of a participatory and integrated security policy; "Comunidad Segura", that was first adopted in 1995 and continues to be enforced. The TransMilenio 'rapid transit system' was created during Enrique Peñalosa's mayoral term, and is a form of bus rapid transit that has been deployed as a measure to compensate for the lack of a subway or rail system. TransMilenio combines articulated buses that operate on dedicated bus roads (busways) and smaller buses (feeders) that operate in residential areas, bringing passengers to the main grid. TransMilenio's main routes are: Caracas Avenue, Northern Highway (Autopista Norte), 80th Street, Americas Avenue, Jiménez Avenue, and 30th Avenue (also referred to as Norte Quito Sur or N.Q.S. for short). Routes for Suba Avenue and Southern Highway (Autopista Sur), the southern leg of the 30th Avenue, were opened in April 2006. The third phase of the system will cover 7th Avenue, 10th Avenue, and 26th Street (or Avenida El Dorado). The system is planned to cover the entire city by 2030. 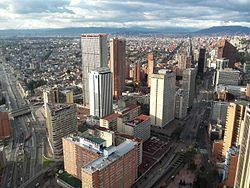 Although the Transmilenio carries commuters to numerous corners of the city, it is more expensive (0.60 USD or 2000 COP) than any public transport, except taxis. Bogotá is the Colombian city with the most extensive and comprehensive network of bike paths. Bogotá’s bike paths network or Ciclorutas de Bogotá in Spanish, designed and built during the administration of Mayors Antanas Mockus and Enrique Peñalosa, is also one of the most extensive in the world. The network is integrated with the TransMilenio bus system which has bicycle parking facilities. Bogota implemented a healthy habit called "Ciclovia" where principal highways are closed from 7:00 a.m. till 2:00 pm on Sundays and public holidays; therefore, the People ride their bikes to enjoy the city as well as exercise. In the same way just on December the same activity is carried out in the night, there are some special activities such as fireworks, street theater performances, and street food just to mention a few. On 25 December 1884, the first tramway pulled by mules was inaugurated and covered the route from Plaza de Bolívar to Chapinero, and in 1892, the line connecting Plaza de Bolívar and La Sabana Station started operating. The tramway ran over wooden rails and was easily derailed, so steel rails imported from England were eventually installed. In 1894, a tramway car ran the Bogotá-Chapinero line every 20 minutes. The tramway provided services until 1948, and was then replaced by buses. There are a number of universities, both public and private. In 2002, there were a total of 114 higher education institutions; in Bogotá there are several universities, most partially or fully accredited by the NAC (National Accreditation Council): National University of Colombia, University of the Andes, Colombia, District University of Bogotá, La Salle University, Colombia, University of La Sabana, Pontifical Xavierian University, Our Lady of the Rosary University, Universidad Externado de Colombia, Military University Nueva Granada, University of America, Sergio Arboleda University, Jorge Tadeo Lozano University, Pilot University of Colombia, Catholic University of Colombia, Saint Thomas Aquinas University and Universidad Pedagógica Nacional. Kids' Choice Awards Colombia, are the most important awards given in the city by Nickelodeon and the first ceremony was given in 2014 by the singer Maluma and in Corferias the ceremony has been the home of shows given by artists like Austin Mahone, Carlos Pena, Don Tetto and Riva among others. The National Library of Colombia (1777), under the Ministry of Culture and the Biblioteca Luis Angel Arango (1958), under the Bank of the Republic are the two largest public libraries in the city. The first is the repository of more than two million volumes, with an important collection of ancient books. The latter has almost two million volumes. 45 thousand square metres (480 thousand square feet) in size, it hosts 10 thousand visitors a day. Bank of the Republic depends also on the Library Alfonso Palacio Rudas, north of the city, with about 50 thousand volumes. Other large public libraries are the Library of Congress in Colombia (with 100 thousand volumes), of the Instituto Caro y Cuervo (with nearly 200 thousand volumes, the largest Latin American library in Philology and Linguistics), the Library of the Academy of History The Library of the Academy of Language, the Library of the Colombian Institute of Anthropology and History ICANH, and many university libraries. Besides the Ibero-American Theater Festival,the largest theater festival in the world, the city has forty-five theaters; the principal ones are the Colon Theater, the newly built Teatro Mayor Julio Mario Santo Domingo, the National Theater with its two venues, the traditional TPB Hall, the Theater of La Candelaria, the Camarin del Carmen (over 400 years old, formerly a convent), the Colsubsidio, and a symbol of the city, the renovated Teatro Jorge Eliecer Gaitan (the highest capacity currently in South America), León de Greiff Auditorium (home of the Bogotá Philharmonic Orchestra), and the Open Air Theater "La Media Torta", where musical events are also held. 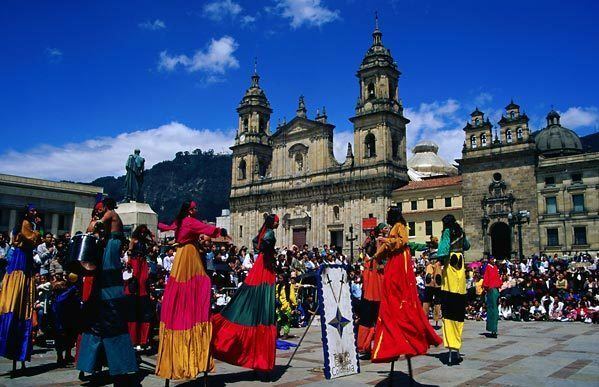 Before the Spanish conquest, the beliefs of the inhabitants of Bogotá formed part of the Muisca religion. From the colonial period onwards, the city has been predominantly Roman Catholic. Proof of this religious tradition is the number of churches built in the historic city center. The city has been seat of the Roman Catholic Archdiocese of Bogotá since 22 March 1564. The seat of the Archbishop is the Primary Cathedral of Bogota; the archdiocese itself is located in new buildings in the north of the city. However a large group of the population nowadays declares itself non-practicing. There is a broad array of restaurants in Bogotá that serve typical and international food. Parque de la 93, Usaquén, Zona T, The G Zone, La Macarena, La Candelaria and the International Centre are some of the main sectors where a number of international restaurants are found, ranging from Argentinian, Peruvian, Venezuelan, Brazilian, Mexican, American establishments to Arabic, Asian, French, Italian, Russian and British bistros, rotisseries, steakhouses and pubs, just to name a few. Typical dishes of Bogotá include the Ajiaco, a soup prepared with chicken, a variety of potatoes, corn on the cob, and guascas (an herb), usually served with sour cream and capers, and accompanied by avocado and rice. Simón Bolívar Metropolitan Park is a large park regularly used to stage free concerts (such as the annual Rock al Parque, a festival in which popular and/or recently formed international, latinamerican, and Colombian rock bands play free of charge). To the north of Bogotá, in the municipality of Tocancipá; Parque Jaime Duque has rides, a giant map of Colombia, popular exhibits, a zoo, and a big hand holding the world symbolizing God. There is a reproduction of the Taj Mahal in the park with a collection of reproductions of famous paintings. The park is also used for large concerts, mainly electronic music ones.